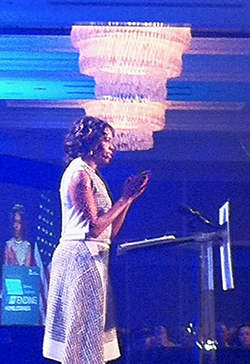 First Lady Michelle Obama delivered a keynote address during the conference on efforts to end homelessness for veterans. Last week I had the pleasure of attending the 2014 National Conference on Ending Homelessness sponsored by the National Alliance to End Homelessness (NAEH). NAEH is a non-partisan, mission-driven organization on the forefront of providing research and education about what legislators, the public, and service providers need to know about homelessness. They work collaboratively with the public, private, and nonprofit sectors to build state and local capacity, leading to stronger programs and policies that help communities achieve their goal of ending homelessness. I attended several workshops that focused on the model of “Employment First,” a practice which argues that most individuals experiencing homelessness want to work and are able to successfully do so with the right supports in place. I was most impressed by a presentation by two researchers from The Heartland Alliance, an organization in Chicago dedicated to returning chronically unemployed Americans back to work. I was pleased to learn they had developed the “Working to End Homelessness Best Practice Series,” an open source resource guide for employment and homeless service providers demonstrating lessons learned from previous initiatives and examples of what works. A woman experiencing homelessness who earns a decent wage has a source of income and gains work experience to build her resume. Employment also gives individuals the chance to identify work habits that might need some refinement, or soft skills that need to be further developed. Employment also contributes to the reduction in cash assistance received. Finally, helping to place clients in jobs impacts recidivism and allows women to obtain safe, stable housing. Calvary Women’s Services is supporting the “Employment First” approach by hiring a full-time Career Developer who will oversee our Step Up DC Employment Placement program and work alongside residents to identify their employment needs and strengths. By focusing on their strengths and developing new skills through Step Up DC, residents will be empowered to make important changes in their lives and attain their housing goals while successfully re-entering the workforce. Jen Van Ness is a case manager at Calvary Women’s Services.